Each wavelength shows a different aspect of this system, known as 3C321. The Chandra X-ray image provides evidence that each galaxy contains a rapidly growing supermassive black hole at its center. Hubble's optical light images (orange) show the glow from the stars in each galaxy. 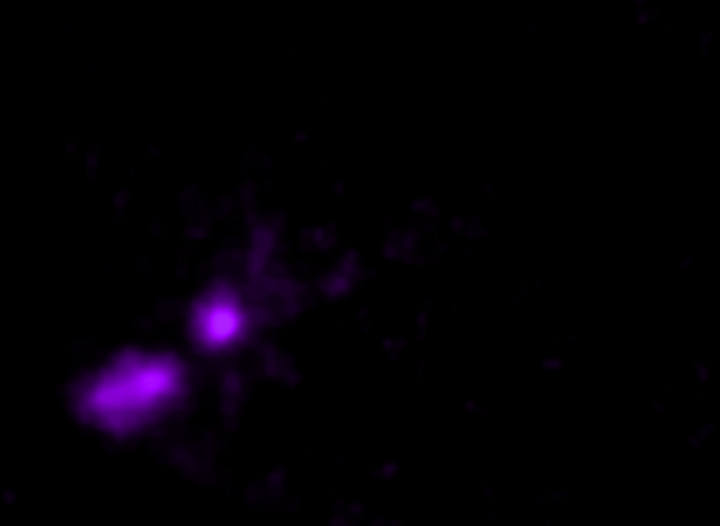 A bright spot in the VLA and MERLIN radio image shows where the jet has struck the side of the galaxy - about 20,000 light years from the main galaxy - dissipating some of its energy. An even larger "hotspot" of radio emission detected by VLA (seen in an image with a much larger field-of-view) reveals that the jet terminates much farther away from the galaxy, at a distance of about 850,000 light years away. The Hubble UV image shows large quantities of warm and hot gas in the vicinity of the galaxies, indicating the supermassive black holes in both galaxies have had a violent past. Faint emission from Chandra, Hubble and Spitzer, not shown in this image, indicate that the galaxies are orbiting in a clockwise direction, implying that the companion galaxy is swinging into the path of the jet. 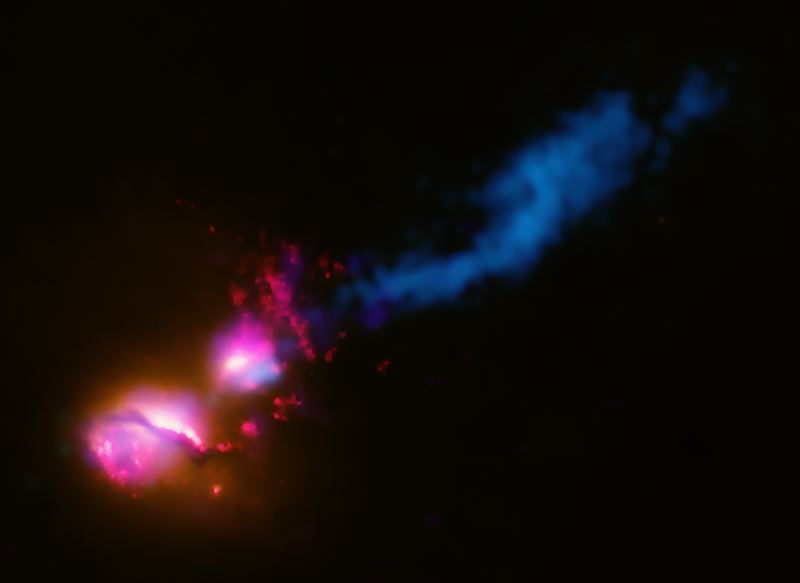 Since the Chandra data shows that particle acceleration is still occurring in this hotspot, the jet must have struck the companion galaxy relatively recently, less than about a million years ago (i.e. less than the light travel time to the hotspot). This relatively short cosmic time frame makes this event a very rare phenomenon. This "death star galaxy" will produce large amounts of high-energy radiation, which may cause severe damage to the atmospheres of any planets in the companion galaxy that lie in the path of the jet. From the Earth we look down the barrel of jets from supermassive black holes, however these so-called "blazars" are at much safer distances of millions or billions of light years. Coordinates (J2000) RA 15h 31m 42.70s | Dec +24° 04' 25.00"